Sometimes, you should sit back and take stock. No, wait. You should sit back and make stock. 1. Because it makes you feel like a pioneer. 2. Because it's cheaper than buying a couple gallons of chicken broth. 4. Because your freezer is too empty. 5. Because rice (or oatmeal) cooked in chicken broth is way better than rice cooked in water. 6. Because it's better than just throwing those bones away. Our first stock used post-Thanksgiving turkey bones, and we currently have rabbit stock in the freezer. We make chicken stock whenever we have chicken bones laying around. After Kaytie roasted Henny and Penny, we put the bones in a baggie and tossed them in the freezer. We've also been saving various vegetable leavings (like leek tops and parsley stems), and on Saturday, I finally got fed up with the random bags in the freezer. I made chicken stock. In case you haven't noticed, this recipe is not going to provide exact directions. You don't need them. 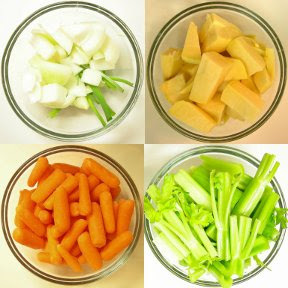 Start with the carrots, onions, celery, and rutabaga, and then add anything else that sounds good. Like a couple bay leaves. I'd stay away from salt & pepper. (You can season the stock later, when you're actually cooking with it.) You should probably go easy on strongly flavored stuff, too, like garlic. In this last batch, I threw in some green onions, leeks, parsley, and turnip shavings. Strain out the bones and veggies, and, using cheesecloth, skim off the fat that might be floating on the surface. Divide the stock into manageable (2-3 cup) portions (like those Gladware or Ziploc containers), and freeze. When you're ready to use it, you can heat it in the microwave until it's thawed completely.